Mike Stern, Bob Moses, Steve Reich, Israel Philharmonic, Jerusalem Symphony, New Israeli Opera. Academies to complete his classical studies. Edmond has performed with legendary musicians such as drummer Bob Moses and composer Steve Reich. In Israel Edmond appeared in musicals such as Chicago, Guys and Dolls, and prime time TV shows such as "Dancing With The Stars". A very versatile musician, Edmond also performs in several jazz ensembles as well as the Israel Philharmonic, Jerusalem Symphony and in the New Israeli Opera. Upon his relocation to NYC in winter 2015 Edmond started to work and perform with guitar legend, Mike Stern. 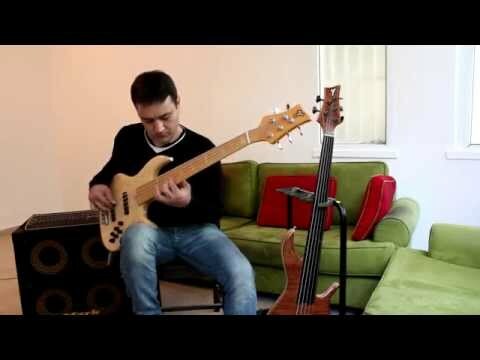 The Markbass artist of this week is Edmond Gilmore! Sept. 18, 2017, 3:26 p.m.
A very versatile musician, Edmond performs in several jazz ensembles as well as the Israel Philharmonic, Jerusalem Symphony and in the New Israeli Opera. Upon his relocation to NYC in winter 2015 Edmond started to work and perform with guitar legend, Mike Stern.